3M Artillery Earmuffs H10B are neckband (aka behind-the-neck) style earmuffs with 3M Peltor's proprietary dual-cup design for excellent ear protection in high-noise environments. The neckband style allows the user to put on or take off the earmuffs with no need to remove a helmet first. The ear cups are fitted with soft, foam-filled cushions for enhanced comfort. Designed for military, police, and tactical specialists in general, this earmuff is compatible with most current protective combat helmets used by the U.S. military, including ACH. These headband style earmuffs provide excellent NRR 29 protection from noise. 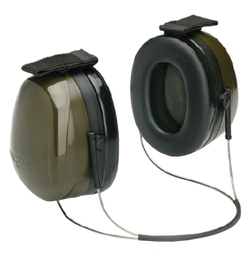 Combined with a pair of earplugs, Artillery Earmuffs assist in complying with dual hearing protection requirements. Up to 5dB of additional noise protection can be achieved by wearing ear plugs under these earmuffs.